“Angola”, argues Paul Theroux near the end of his searing travel book, is a “foreign land without a face”, little written about, where even birdwatchers and backpackers fear to thread. This is overstating it a bit for a country now swarming with hundreds of thousands of expats and a plethora of flights to Europe and East Asia, but Theroux’s broader point is correct. A former Portuguese colony, oil-rich Angola was long isolated from the outside world by a vicious war that lasted more than four decades. The war may have killed up to a million people but its complexity and remoteness meant that it never inserted itself in the global consciousness. International news coverage, such as it was, focused on burnt-out cities, blood diamonds, amputees, and the cast of mercenaries and profiteers washing up on Angolan shores, but rarely provided an understanding of the country’s predicament. Yet Angola’s trajectory following the government’s defeat of the rebels in 2002 has been extraordinary. In a short space of time, it became one of the world’s fastest growing economies and sub-Saharan Africa’s third largest, with a 2012 GDP of US$114 billion. It is now China’s major trading partner on the continent. Luanda garnered the title of the world’s most expensive city amidst a Dubai-inspired urban reinvention. As a political scientist working on Angola for more than a decade, I felt excitement at the prospect of a major writer such as Theroux engaging with this fast-changing reality: significant in its own right, this also spoke of the great amount of interest that the country is now eliciting. Last Train to Zona Verde (Hamish Hamilton, 2013) starts in Cape Town, where Theroux ended his Cairo to Cape journey a decade ago. The ambitious goal of this trip, we soon find out, is to accomplish a similar feat by traversing the continent all the way to Timbuktu in West Africa. Theroux’s sheer physical stamina and the mostly uncomfortable conditions he endures as he wades north are laudable. Already in Dark Star Safari, this work’s predecessor, intimations of aging and death affected Theroux. A decade later, such concerns haunt the seventy-year-old author and account for the most elegant pages in the book. 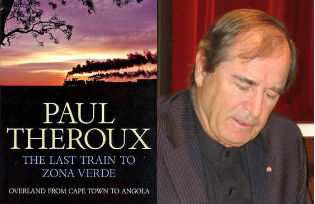 Of course, this being Theroux, our respect for the travelling feat is constantly tested by intemperate broadsides against that old nemesis the aid industry, assorted Hollywood stars trying to save the benighted continent, and just about anything urban or modern about Africa (“Another African city, another horror, another chaos”). But this is entertaining enough and I followed Theroux in a mood of anxious anticipation as he pushed towards the Namibian-Angolan border. Though covering less than half of the book, Theroux’s encounter with Angola is both its heart and an important literary marker in Therouxland. Theroux braves Angola’s killer roads, increasingly weary and vulnerable in the hands of stone-drunk, red-eyed drivers. A Kwanyama initiation ceremony briefly rouses him into a paean of traditional Africa, and some portraits of people met in Lubango and Benguela are fully realized, but this is outstripped by Theroux’s sense of foreboding and relentless focus on squalor, vulgarity and gangsta rap youth. Theroux’s Angola is a cursed and irredeemable land. The book’s one true optimist, we find out, is later bludgeoned to death. A worldly-wise Luandan who describes his city in Last Train’s most memorable line, “this is what the world will look like when it ends”, and whom Theroux befriends, soon dies of a heart attack. Nearly traumatized by the “awfulness” of Luanda, and forlornly anticipating an onward journey beset by crime, Islamic terrorism and warfare, Theroux ends his travels and declares this truncated experience to be his valedictory African journey; Angola did it for him. Last Train draws to a close with a curmudgeonly rant where an interest in much of contemporary Africa (“squalid cities and fetid slums”) is equated with the métier of the proctologist: “Such a person, deft in rectal exams, is as essential to medicine as any other specialist”, but Theroux deems himself too old and temperamentally unsuited to engage in what he terms “the grand colonic tour”. Is Angola that bad? Did Theroux get the place completely wrong? As with Dark Star Safari, this book contains its share of hasty generalizations, factual mistakes and hearsay. The urban legend of Chinese convicts employed in African construction work is mentioned as a fact, though there is no evidence for it; Angola is repeatedly referred to as a major gold producer, which it isn’t; and there are exhausting diatribes against the Portuguese, faulted in all sorts of ways, but mostly because their colonialism is implicitly compared with the orderly versions more to Theroux’s liking, and found wanting. Amidst this cantankerous sloppiness, what is surprising is the fact that Theroux gets important things right. Only a decade ago, Angola’s power elite was clueless about image management and the country’s reputation was that of the proverbial heart of darkness. Now the country is awash with Brazilian political marketing consultants manicuring the regime’s reputation. Yet, unimpressed by the international roadshows and CNN paid advertisements peddling the new Angolan Eldorado, the savvy interviews with new oligarchs advertising their art and charity credentials, and nervous expats’ claims that the country is improving by leaps and bounds, Theroux doesn’t pull any punches. The xenophobic visa regime and the rudeness of officialdom, the rapacious police preying on the weak, the oil-fuelled architectural extravaganza, the sea of shantytowns abandoned by the state: Theroux’s pithy portrait will not endear him to the Angolan tourist board but will be recognized by anyone with a more than superficial acquaintance with the country. Nowhere is he closer to the truth than in his mordant descriptions of Angola’s rich, their gated communities shutting out the ugliness of poverty, the $47,000 a year schools where their children are pampered away from the rabble, their conspicuous consumption and disdain for the destitute. There is no denying that this elite, sitting atop unprecedented resources, runs Angola with an iron fist. But Theroux’s impatience ultimately leads him to glide through a complex society, pass judgment, and move on. He never makes it to zona verde, the forested hinterland of Angola, and ignores the strong sense of national identity and belief in a better future that are pervasive in postwar life. Indeed, much that might nuance his sententiousness and Kurtzian worldview is given short shrift. When average Angolans prove to be an upbeat lot, despite their wretchedly poor lives, Theroux complains of “high spirits bordering on hysteria… the leaping and the laughter did not seem mirthful to me, but rather frantic”. A scholar of Angola might see this as a refusal of local knowledge and lack of empathy, but we know Theroux’s views on this line of professional expertise. Still, there are more efficacious alternatives within Theroux’s own travel writing genre that he has failed to take up. His mentor V. S. Naipaul, for instance, managed to write three strikingly critical books on modern India yet end on the realization that this protean society had unleashed a massive dynamic of social disruption, upward mobility and political transformation. Angola, too, is undergoing a maelstrom of change that holds vast potential as well as pitfalls. This is not the sort of Afro-optimist statement Theroux enjoys ridiculing: the Angolan trajectory cannot be perceived in linear ways and may not result in “improvement” however defined. But it is deserving of serious, unflinching engagement. Despite memorable vignettes, Theroux hasn’t done so. He has nonetheless unwittingly performed a service to anyone interested in Angola by inserting it in the mainstream global landscape; others will follow.